This tutorial will explain how to convert Slack channel into a live blog. You can now easily convert any of your Slack channels into a live blog. This can be done with the help of a free Slack app called “Echothread“. After integrating this app, you can invite it to any channel and then it will generate a live blog URL for that channel. In the live blog, you will start seeing all the messages you send and receive on the channel in real-time. In addition to text conversations, this app can also display media files, documents, links, and more. Converting a Slack channel into a live blog can be useful if you want to broadcast important Slack conversations with others. Mostly, for the people who are not a part of your Slack team. Do note that the generated URL will be a public URL, which means all the messages and files from the channel will be accessible to the people with whom you share the live blog URL. 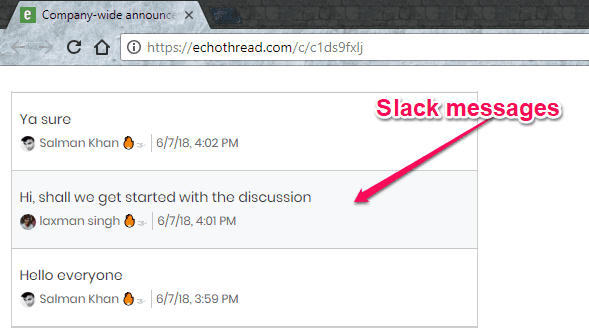 To get started, simply browse the homepage of Echothread and then click on the “Add to Slack” button. After that, it will ask you to authorize this app to integrate it with Slack. Once you’re done with that, you can go ahead and invite the “Echothread” app to any Slack channel that you want to convert into a live blog. 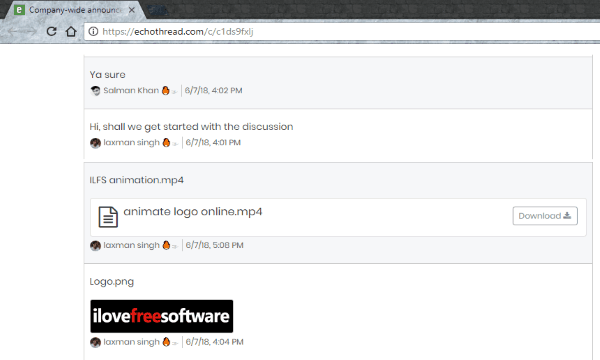 To do that, simply open the channel, type “/invite @echothread“, and hit Enter. 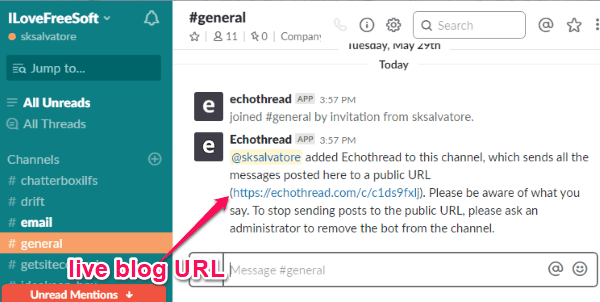 After you have invited this app to the Slack channel, it will automatically generate a live blog URL for that channel and send it to you in a message. This will be a public URL which means the content of the live blog will be visible to all with whom you share the URL. Now, when you open the live blog URL, you will initially see a blank web page. But, as you start conversations in the Slack channel, all the messages will automatically update in the blog in real-time. Not just your messages, this app will also show the messages sent by your team members. The messages can be seen in a text box with the sender name, date, and time. 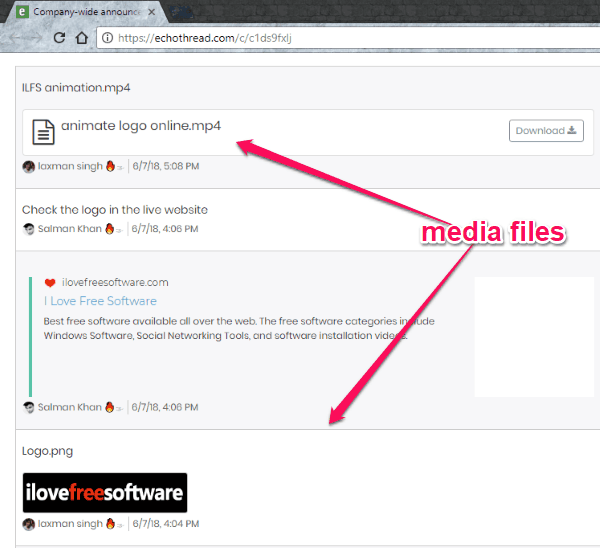 Not only the text conversations, this Slack app can also display media files (like images and videos), documents, links, etc. in the live blog. The users with whom you have shared the blog URL will be able to view and also download the media files directly from the webpage. So, this is how you can convert a Slack channel into a live blog. 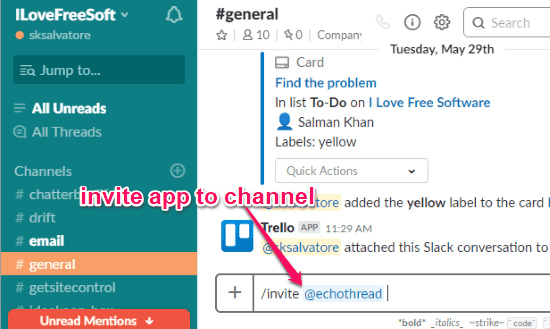 The “Echothread” app for Slack makes it pretty straightforward to do that. No coding and no hassle, as this app will convert the channel for you automatically. In case you want to broadcast important Slack conversations with others, who are not in your team, then converting a channel into a live blog is probably the best option for that.